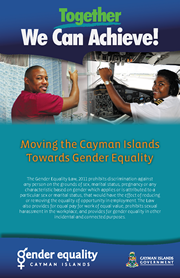 Following the Cayman Islands Government’s December 2013 request for the United Kingdom to extend the Convention on the Elimination of All Forms of Discrimination against Women (CEDAW) to the Cayman Islands, the Ministry of Education, Employment and Gender Affairs will host the first National Conference on Women on Saturday, 29th March 2014 from 9:00am to 3:00pm at the Westin Grand Cayman Seven Mile Beach Resort. With the theme “Inspiring Change”, the Conference will bring together women and men of differing ages and cultural backgrounds to address the social, cultural, economic and political challenges that girls and women experience in the Cayman Islands and to encourage positive changes in individuals and our society as a whole. Through an interactive agenda, the morning session will provide an opportunity for attendees to discuss the key areas relating to CEDAW in focus groups and for the Ministry to collect qualitative data regarding priority issues and any potential areas of concern. During the afternoon session, Dr. Glenda P. Simms, a renowned CEDAW expert from Jamaica who served on the United Nations CEDAW Committee for four years, will deliver a motivational keynote address focusing on how we can all become ‘Architects of Change’ in our personal lives and in our society. Lady Rabia, a well-known local performer and advocate for gender equality, will also deliver a spoken word performance, and the Hon. Tara Rivers, JP, Minister for Education, Employment and Gender Affairs, will address attendees on Government’s commitments to empowering women and promoting gender equality. 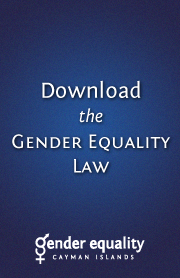 The Ministry’s Gender Affairs Unit has planned the Conference as part of Honouring Women Month – which is observed in March each year – and participants may attend the full day or only the morning or afternoon session. There is no registration fee and complimentary continental breakfast and lunch are included, but spaces are limited and pre-registration is essential. Registration forms are available online or from the Government Administration Building. 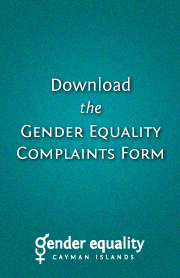 For more information, please visit www.genderequality.gv.ky or contact the Gender Affairs Unit at genderequality@gov.ky or on 244-3226.